Currently living in Istanbul and Zurich, Switzerland, Burhan Öçal found himself in the bosom of the world of music and art from the very first days of his arrival in Europe. His inclination and enthusiasm for discovering new horizons led him to meet prominent global musicians and artists at an early age, with many of whom he had joint projects, and he continues working with them today. During his early years in Switzerland, Burhan Öçal worked with Pierre Favre, a national jazz celebrity. His works with Swiss jazz piano artist George Gruntz, world renowned Portuguese classical pianist Maria Joao Pires and Australian pianist Peter Waters followed..
Having performed several concerts across the globe and meeting the legendary Joe Zawinul, the creator of Weather Report, radically changed his career plans. He performed as a soloist for 10 years as a part of Zawinul’s symphonic jazz project. 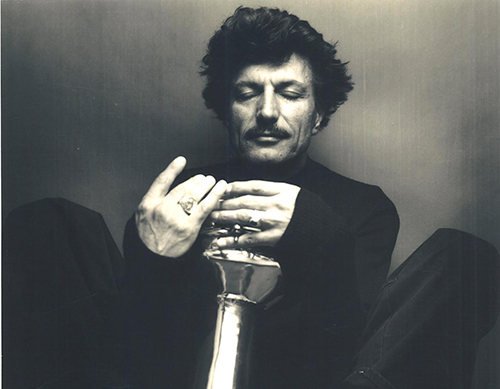 Never losing touch with his roots, Öçal formed the ‘’Istanbul Oriental Ensemble’’. In the course of 20 years, the band gave concerts across the globe and became a world famous ensemble. The first two albums, Gypsy Rum and Sultan’s Secret Door, which Öçal recorded with the ‘’ İstanbul Oriental Ensemble’’ received the ‘’Preis der Deutschen Schallplattenkritik’’ award, the German equivalent of Grammy. During that time, he met Sting with whom he has performed for many years. He gave concerts in several countries, including prominently the US, alongside the world famous Kronos Quartet. In the same year, Öçal met Eliot Fisk, the renowned classical guitarist. This duo gave concerts across the US and Europe for 10 years. Öçal released the Groove Alla Turca album with American jazz bass guitar player Jamaaladeen Tacuma, an important jazz artist and also a close friend. His solo album Jardin Otoman received Le Monde de la Musique’s ‘’Choc’’ award. As a homage to his homelands Trace, Burhan Öçal recorded two albums and gave various concerts with ‘’Trakya All Stars’’ orchestra. The albums and the orchestra’s success was none the less. Both albums were nominated as the best ethnic music albums in Turkey. He is a regular guest at the Jazz Festivals in Montreal (where he before an audience of 150 thousand) Montreux, Chicago,Paris,Istanbul,Vienna,Berlin as well as the Womad World Music Festival. Öçal also performed as a soloist with many spectacular Symphony Orchestras. With British conductor Howard Griffiths and the Zurich Chamber Orchestra he released the Concerto Alla Turca album in 2007. 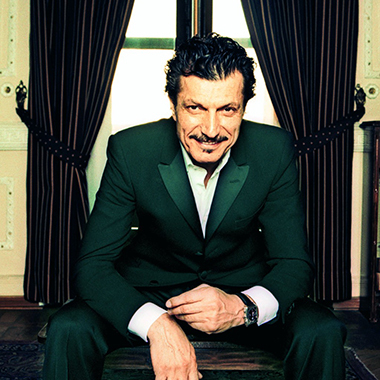 Öçal’s undying passion for cinema led him to acting. He is playing the lead part in several cinema films and some television dramas. He had been the ad star for the renowned Derimod brand and was performing for a video clip alongside hip hop artist Pharell Williams during a commercial shoot for the Hennessy brand, Öçal became the ad face of the brand in the US. 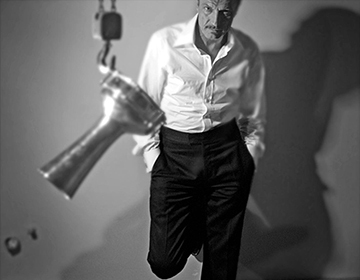 His works with artist like the world famous photographer and director Michel Comte. Öçal, currently on tour with İstanbul Oriental Ensemble, Trakya All Stars and classical duo project with Alexey Botvinov. San Francisco Classical Voice - “…my first impression was that if Zakir Hussein is king on Indian tabla, then Burhan Öçal is emperor of Turkish darbuka drumming. 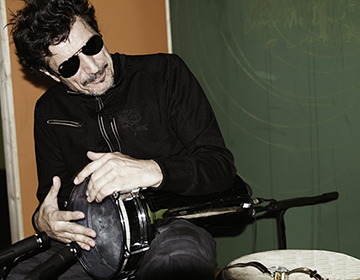 Öçal is also an entertainer with irresistible charm..."
Los Angeles Times - "One man percussion orchestra"
Le Monde - "(They weave) togather the sacred and the profane, the poetic and the stylish, in perfect harmony." La Nouvelle Republique - "Each season there are certain evenings like this. Evenings when you say to yourself, This is really exceptional. Superb, magical.' So it was Friday night with the Istanbul Oriental Ensemble and its extraordinary leader, Burhan Öçal. In brief, Burhan Öçal embodied more than just music, but rather a page from history and the power of an unceasing imagination. He is, simply put, one of the best percussionists I have ever heard." La Liberation - "The sonorities are exceptional. A jubilant virtuosity and energy suffuses his music." FrankfurterAllgemeine Zeitung - "Mr.Öçal's music is a great cultural feat. His tone is diverse, complex and sophisticated. His virtuosity, superb." Le Nouvel Observateur - "Mr.Öçal offered a survey of the great music and poetry of The Ottoman Empire with his infinitely refined and perfect ensemble. He produced nothing but delights.,"
Tages Angzeiger, Zurich - "Energizing the concert was the Istanbul Oriental Ensemble with Burhan Öçal, who expanded the boundaries of conventional programming. The overall effect was stunning."